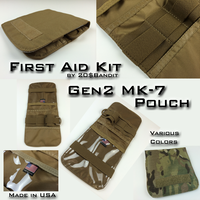 The Gen2 MK-7 Mini Medical Kit (IFAK), by 20$Bandit, is the newest addition to the MK-7 family. The GEN2 Mini Kit represents over three years of research and development combined with a meticulous new manufacture HonorPoint-USA out of San Diego, CA. The Mini Kit MK-7 was designed to be a compact organizer for kit or gear that would otherwise be loose in your pocket or backpack. If you stow that fire steel, compass, tarp and knife in the MK-7 and hang it from your shoulder using 550 Para-cord, you’ll have a pretty nice woods kit. Mount multiple kits together within a larger unit, and you have a well organized pack with removable pouches. The skies the limit with this compact designed and when it comes to keeping your field gear organized for quick access, this is one route you should consider. Purchase of Medical Kit inserts. (RMK, MMK, P-FAK, BMK, UMK, & other options).